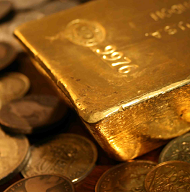 GOLD PRICES pulled back from 4-month highs above $1340 per ounce for the third day running in London on Wednesday, again trading lower for non-Dollar investors as the US currency fell once more. Asian and European stock markets also headed south after Wall Street marked a "key reversal" from fresh all-time record highs for technical analysts, closing 0.5% lower overnight after rising sharply earlier on Tuesday. Two-year US Treasury yields rose again as bond prices fell, extending their run above 2.0% – the highest level since the Lehman Brothers' crash of September 2008. Adjusted by inflation expectations, 10-year yields closed last week at 0.54%, up by 10 basis-points from the end of 2017 for the sharpest rise since October. "Gold shrugging of moves in real US rates at the moment," says strategist John Reade at the mining-backed World Gold Council, noting the typical negative connection between gold and inflation-adjusted rates. Reade also notes that Dollar-priced gold currently shows its strongest negative correlation with the Dollar's trade-weighted currency index in more than 18 months. While gold flirted overnight with its highest Dollar price since early September, the Euro gold price touched a 2-week low. Gold priced in Dollars currently trades within 3% of the top of the last 2 years' trading range, and some 23% above its low. 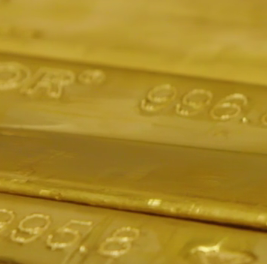 For Euro gold prices, the metal is 12% below its 2-year high and 10% above its low. 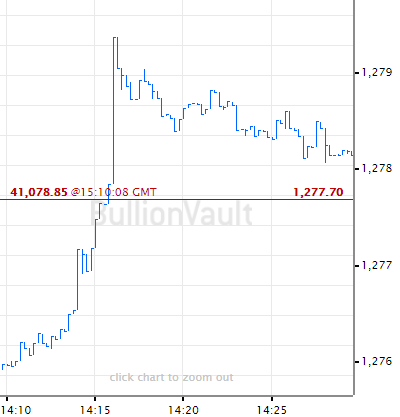 "Gold [is] forming a possible double top on hourly chart," says the latest technical analysis of the Dollar price from French investment and London bullion market-making bank Societe Generale, pointing to gold's test in today's Asian trade of Monday's $1344 level. Longer term says SocGen, "Gold is slowly inching towards $1350/1356, the neckline of the multi-year inverse Head and Shoulders pattern" it identified again last week. First however, "a limited pullback looks on [the] cards." Over on the political front Wednesday, officials in Ankara said Nato military alliance member Turkey is set to extend the state of emergency imposed since a failed coup attempt in July 2016 – blamed by the government on US resident Fethullah Gulen. "I have bluntly told Tillerson that the [Kurdish] situation is very unfortunate and serious...could threaten our bilateral ties, and could lead us toward an irreversible route," said Turkey's Foreign Minister Mevlüt Çavuşoğlu after meeting the US Secretary of State in Vancouver today, referring to Washington's plan to back a "border defense force" in neighboring Syria. A US official today denied that Washington's plan includes backing separatist Kurdish group the YPG, now under threat from Turkey of being "crushed" in the Syrian region of Afrin. Police in Balkan state Kosovo meantime offered €10,000 reward for information about Tuesday's murder of "moderate" Kosovan Serb leader Oliver Ivanovic – an investigation that Serbian President Aleksandar Vucic has asked must include officers from his country. Reports compiled for the US Senate and separately by the UK House of Lords have this month both accused Serbia of "backsliding" on democracy, with the US researchers saying Russia has a "malign influence" in the Balkan state. Amid fresh tensions between nuclear-armed India and Pakistan over military exchanges along the disputed border of Kashmir, "Pakistan does not want any [US] aid and Pakistan will not compromise over its national interests," said Foreign Minister Khawaja Asif today, referring to US President Trump's accusation that Islamabad supports Taliban and radical Islamist groups in Afghanistan. "The US must stop putting the blame of its own failures on Pakistan."